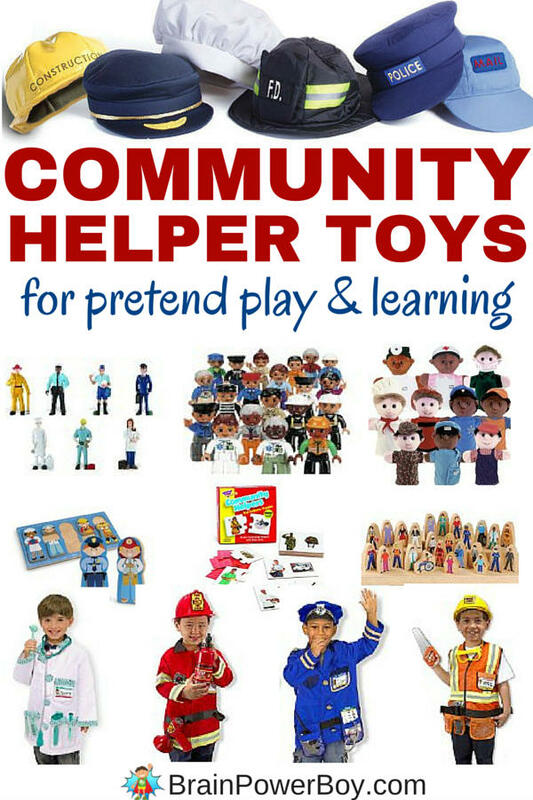 Use these community helper toys for pretend play and learning, to find out all about community helpers. Community helpers are a natural interest for many boys. When the “what do you want to be when you grow up” question comes up fireman, construction worker and policeman are popular choices. The toys below are fun for kids and with a bit of discussion and some play time they will learn all about those who are helping in their own communities. If you have little ones you will like this set. The Fisher Price Little People Wheelies set comes with an ambulance, fire truck, police car and helicopter and they all include Little People to drive the vehicles. Great community helper vehicles set. Safari Toob has a nice community figures set. 7 Everyday Heroes includes “a construction worker with hardhat and toolbox, policeman, mailman with carrier and mail, pilot, chef, fireman with hose and axe, and veterinarian with puppy.” I like these sets for some excellent imaginative play opportunities. If you prefer wooden figures try this 25 Piece Wooden Community Helper Set. The blocks are very nice and there is a bigger variety of helpers. LEGO Duplo has a very nice set of community helpers that has 20 different figures. If you already have some DUPLO this would be my top figure pick. I know they will get a lot of play time. We had a puzzle like this when my son was young. Community Helper Matching Puzzle has nice photographs on the puzzle pieces which you use to match the helper with the object they use. Ex: firewoman to fire hose, policeman to police badge and so on. The mix-match-stack puzzle set is great. You can mix and match the pieces for a fun mix-up or put them together the “right” way to see five different careers. If you have a flannel board these are a nice choice: Community Helper Flannel Figures has six 16 inch figures, three women and three men as well as a wide variety of clothing and accessories. This is the one I thought had the most value for the money. There is a kit with community helper dress up clothes See here which is great for classrooms or daycare providers. You can also buy community helper costumes individually: fireman, construction worker, police officer, doctor and more. These are the Melissa and Doug brand costumes which are highly rated and made of good fabric with sturdy stitching. I also like that they include more accessories than the kit above. If you don’t want to go for costumes, try these pretend play hats instead. We had a whole collection of community helper hats, they were reasonable, and I don’t regret buying them one bit. They were heavily used. If you have a child who likes puppets these would be a great addition to your selections. Community Helper Career Puppets comes with 10 different puppets all with embroidered eyes which means even young children can play with them. Includes armer, postal worker, soldier, police officer, fire fighter, chef, safety worker, surgeon, doctor, nurse. Play and learning go hand-in-hand. You can use community helper toys and your child will learn a lot while playing, talking and interacting with you. These make nice gifts for boys as well. For other ideas see our gift ideas for boys page.